COMMERCIAL HOVERCRAFT | European hovercraft manufacturer. Hovercraft work best where it is difficult, if not impossible, for conventional boats to operate. If you need to travel over land or shallow water, sand, mud, rocks, weeds, logs, debris, ice and rapids and achieve speeds of up to 40 knots then we have the solution for you. 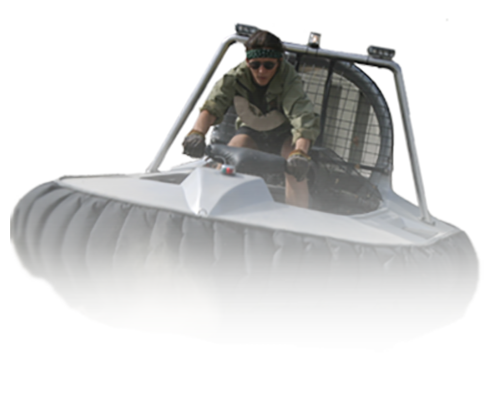 At EUROHOVER Ltd we are passionate about providing the best possible hovercraft solutions for our customers. We do not just build craft, we seek to understand our customers’ aims and deliver a package that meets their needs. . Craft are designed to our customers’ specific requirements and are adapted for search and rescue, passenger carrying, open well deck cargo carrying applications fitted to meet the demands of the local terrain and climate. Our customers are supported by our service agents and an after-sales support team who provide pilot and engineer training, military tactics training, operational consultancy services and design expertise. Our experience is not just limited to the production of fast amphibious hovercraft; there are many such military, paramilitary and commercial applications for the air cushion principle and EUROHOVER Ltd leads in Estern Europe designing and building such unique solutions to satisfy our clients’ particular needs. Eurohover Hovercraft only exerts 0,07 atm ground pressure when on hover, compared to an average human footprint of 0,55 atm. The Hovercraft is fully amphibious and floats when off hover like a standard marine barge. Level ground conditions such as swamps, shallow water, soft mud, ground fast ice, tundra, permafrost, sandbars, wet sand, deep water and land are perfect for the Hovercraft.